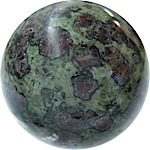 Item #GSE-100: Average 1" diameter, Christmas Stone Sphere (Norway) feature purplish Red Garnet crystals in Green Peridotite. Item #GSE-352: Average 1.25" diameter, Christmas Stone Sphere (Norway) feature purplish Red Garnet crystals in Green Peridotite. 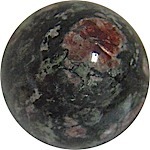 Item #GSE-116: Average 1.4-1.5" diameter, Christmas Stone Sphere (Norway) feature purplish Red Garnet crystals in Green Peridotite. Item #GSE-368: Average 1.7-1.8" diameter, Christmas Stone Sphere (Norway) feature purplish Red Garnet crystals in Green Peridotite. Item #BE-141: 11mm Chinese Turquoise dragon bead. Carved with little or no matrix in blue or blue/green. Stylized dragon is detailed on opposite sides of the bead with a Chinese symbol on opposite side. Item #BE-142: 12mm Chinese Turquoise dragon bead. Carved with little or no matrix in blue or blue/green. Stylized dragon is detailed on opposite sides of the bead with a Chinese symbol on opposite side. Item #GSE-197: 133mm Quartz Sphere; transparent with natural inclusions; 8.15 lbs. 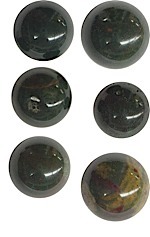 Item #GSE-118: Lot of six 14-18mm diameter Fancy Jasper Spheres. Each lot contains a nice mix of Jasper spheres in Green, Tan, Brown and Rust Red. Some are solid colors while others display mingled shades of colors. Item #BE-143: 14mm Chinese Turquoise dragon bead. Carved with little or no matrix in blue or blue/green. Stylized dragon is detailed on opposite sides of the bead with a Chinese symbol on opposite side. Item #PF-383: 18" necklace of 8-8.5mm baroque Japanese treated Blue Cultured Pearls and 14Kt. Yellow Gold fish hook clasp with two .5mm round Blue Sapphires. Item #PF-382: 18" necklace of 8-8.5mm baroque Natural Silver Cultured Pearls with 14Kt. Yellow Gold spring ring clasp. 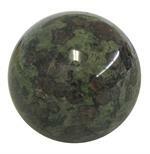 Item #GSE-118: Lot of six, 14-18mm diameter, Fancy Jasper Spheres. Each lot contains a nice mix of Jasper spheres in Green, Tan, Brown and Rust Red. Some are solid colors while others display mingled shades of colors. Item #SS-1957: Indiri Collection 21mm Bali Woven Disc Sterling Silver Earrings; Lever backs. 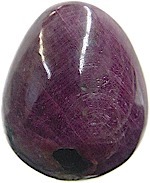 Item #GSE-108: 30mm tall, dark Purple/Red Ruby Egg with some slight inclusions. 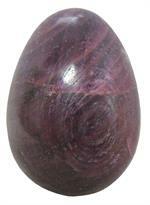 Item #GSE-579: 35mm Ruby egg. Approx. 190.00 cts. 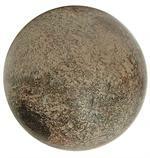 Item #SS-1958: Indiri Collection Sterling Silver 40mm Bali Woven Disc Pendant. 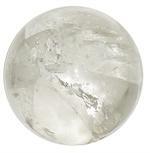 Item #GSE-393: 6" Quartz Sphere. Item #SS-2059: Adjustable 6 3/4"-8" Handcrafted Indiri Collection Sterling Silver Bali beaded bracelet with nine 6x8mm oval Almandite Garnets and lobster claw clasp. Item #GSE-466: Average 67-77mm diameter Christmas Stone Sphere (Norway) feature purplish Red Garnet crystals in Green Peridotite; approximately 521 grams. Item #SS-2270: 7"-7.75" Adjustable Indiri Collection Sterling Silver Bali station bracelet with four 10mm round Amber cabs and lobster claw clasp. Item #SS-2269: 7"-7.75" Adjustable Indiri Collection Sterling Silver beaded station bracelet with lobster claw clasp. Item #SS-2268: 7"-8" Adjustable Indiri Collection Sterling Silver Bali bracelet with eight faceted 8mm cushion Black Onyx and lobster claw clasp. Item #SS-1960: 7.5"-8.5" Adjustable Indiri Collection Sterling Silver Bali graduated woven disc link bracelet with two 21mm discs, two 26mm discs, one 31mm disc and toggle clasp. Item #SS-2299: 8.5" Indiri Collection Sterling Silver Bali heavy textured link bracelet with hammered barrel clasp.